For new website visitors! We frequently note and record the weather that we personally experience, because we believe that government bodies and the MSM deliberately hide the truth in pursuit of the political agenda of Man-Made Global Warming. 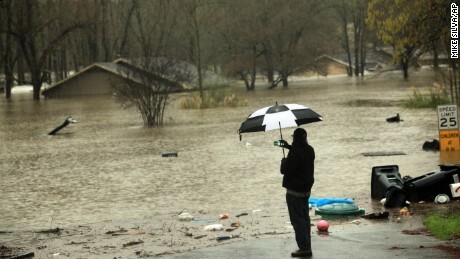 Here in middle California the extremely cold winter has continued, broken only by a number of heavy rainstorms. Every night there is a deep frost. The winter of 2016/17 looks to be one of those that occur every few decades when California’s natural droughts are interrupted, rivers overflow, land slides and grass grows. The lush growth will increase the number of wildfires in July, August and September, when the months of normal hot sun burns everything dry. California will endure another water shortage this summer despite the rains of winter. Partly this is because the environmentalists have for decades prevented damn building, but mostly because Silicon Valley is importing thousands of immigrants, and ‘development’ is covering the valleys with high-density housing, shopping malls, parking lots and roads – all requiring more water. The truth of this will not be told and water shortages will be blamed on Man-Made Global Warming.